ಹಿಂಗ್ಯಾಕೆ? 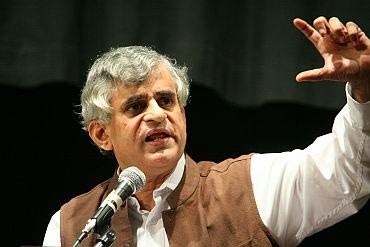 : P. Sainath: 100 days of Namo and Sycophant media. What are the typical hundred days, regardless of which one of these different people had been there in last twenty years, what happens in hundred days typically in rural areas? Well this is what happens and all the data is official. In a hundred days 4,600 farmers commit suicide in rural area 46,000 to 69,000 attempted. The Police say the attempt ratios are ten to twelve for one successful suicide, that’s the police figure. NGO’s like SNEHA which work with suicide victims say that’s nonsense, it’s fifteen times, the ratio is 15 to 1. Fifteen attempts to one successful suicide. So 46,000 (if) you choose the police, 69,000 (if) you choose the independent assessment. So in hundred days 4,600 farmers will commit suicide, 46 to 69 thousand will attempt it, two hundred thousand will seize to be farmers. The country is losing full status - full time farmers at the rate of two thousand a day for the last twenty years. By full time farmer I mean main worker cultivator as defined in the census of India, which is you ought to have done farming for 180 days in a year. Not less than that, less than that you are a marginal farmer. If you are working for six months or more in a year on that thing, obviously your main income is from that occupation. I am just saying this because I used to think that why did they have 180 days, why did the Babu’s decide on this figure and I sort of concluded that it’s because Babu’s work for about 180 days a year! But really, the figure, 6 months shows that you are dependent, mainly dependent on this. So that person is called a main worker cultivator. The population of main worker cultivator has fallen and fallen dramatically; till 1991 it was rising, meaning people with land, it was rising. Between 1991 and 2001 census the number of full time farmers fell by 7.2 million. Between 2001 census and 2011 census the number of farmers declined by 7.7 million. That’s the total of 15 million decline in twenty years. You do the maths, in the last ten years we are talking about 2,038 every day. Now which section is rising, this is in a time of rapidly declining rural population growth rates. The fall in rural population’s growth rate is much higher than the fall in the urban population’s growth rate. Specially for comparing it with the age of steels, though the family size is still much bigger. So, 4,600 suicides 46,000 to 69,000 attempts, all in a hundred days; two hundred thousand farmers will seize to be full time farmers, thousands will have left the country side, tens of thousands will have left the country side in a hundred days headed for urban areas in search of jobs that are not there. In the capital city of Delhi alone there are estimates of between 1 lakh and 2 lakh adolescent girls from Jharkhand working as full time maids, domestic maids on twenty four hour call in the houses of the better off of Delhi. Jharkhand is a very small state, I mean very small population it doesn’t have a big population, it took about twenty odd million out of Bihar. Between 1 lakh and 2 lakh adolescent girls working, remember the principle, that the tender age and youth of childhood will not be subjected to exploitation and abandonment. Did the constitution framers ever foresee how seriously those principles will be violated, despicably violated. In the hundred days a few thousand children will die of malnourishment and hunger related diseases in your country. In hundred days thousand more children will enter grade 3 and grade 4 malnourishment which are stages of malnourishment from which it is very hard to stage a comeback. From grade 4 malnourishment there are no comebacks, you can live but your cranial capacity everything are severely damaged. All the data that I give you is official. One more piece of official. In the hundred days and this is based on your latest budget, in the same hundred days that all these astonishing things will happen in rural India, the Govt of India alone, writes off in the budget 1,45,753 crores in concessions to the richest one percent or two percent of the country, you can all read these figures if you are interested and I hope damn well that you will be interested in the annexure to the budget called the statement of revenue foregone. Last year, the 2013’s write-offs under just three heads – excise duty, custom duty and direct corporate income tax amount to 5 lakh 32 thousand crore. Every year for 6 years, the amount return off for the super rich in weavers has been close to or higher than the budget deficit. You know the single largest item in the two three years, in last seven years? We have data only for 9 years; do you know how much the concessions add up to? 36.5 trillion rupees! Trillion! Just try accommodating twelve zeros in your head! That is 36 and a half lakh crores! Not 36 and a half lakhs, its 36 and a half lakh crores is 36.5 trillion rupees. Do you know what you can do on 36.5 trillion rupees? You can run the rural employment guarantee scheme for only 105 years, at current levels of funding. Which means that every agricultural labourer living today can have two lifetimes of NREGS. It actually works up. You can run the food security act - another truncated, amputated mutilated directive principle – you can run that for 31 years. Just on this year’s budget 5 lakh 32 thousand crores, you can run the NREGS for about three decades and food security act for five years or four and half years if I want to be precise. So don’t tell me that there is no money, what you have is inequality and what you have is what the constitution descirbes as the operation of the economic system leading to concentration of wealth and the means of production to the determent of the common good. This should receive the widest possible coverage. this can't receive widest coverage! no glamour in that!